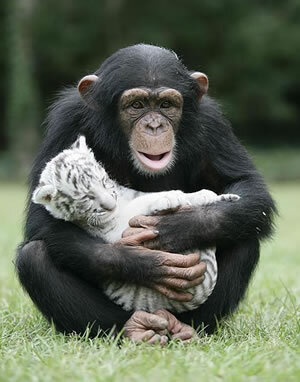 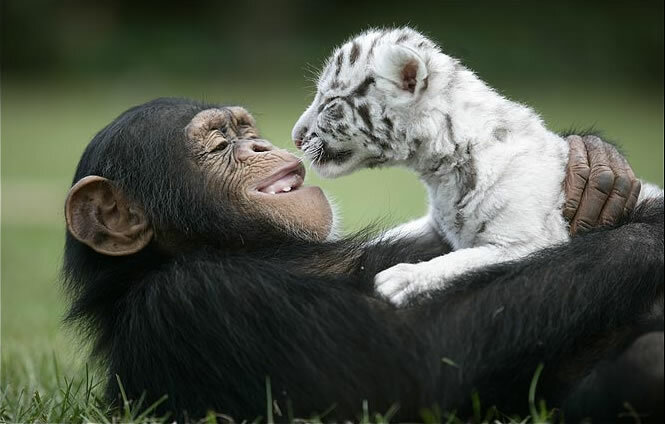 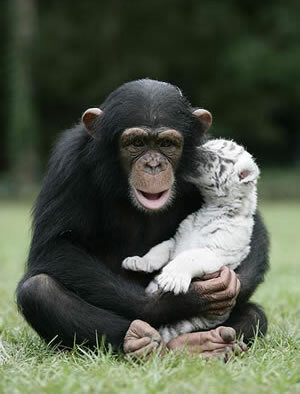 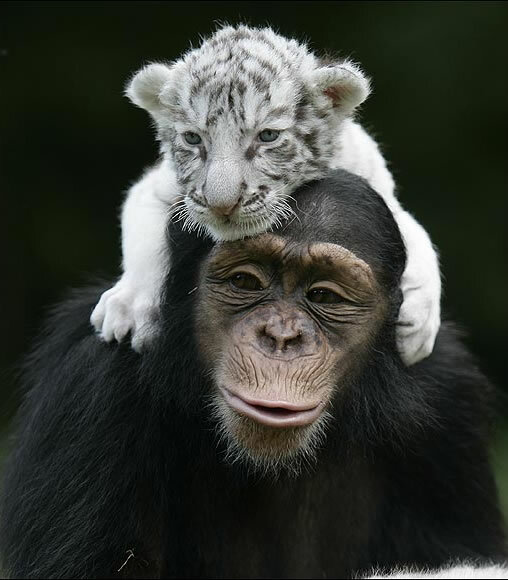 THIS cute chimp isn’t just a primate - she is this baby tiger’s BEST mate. Loving Anjana cradles the white tiger cub after acting as surrogate mother to him and his twin brother. 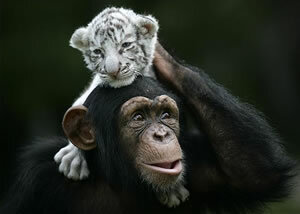 And the two-year-old chimpanzee clearly isn’t monkeying around, she has also raised LEOPARDS and LIONS. 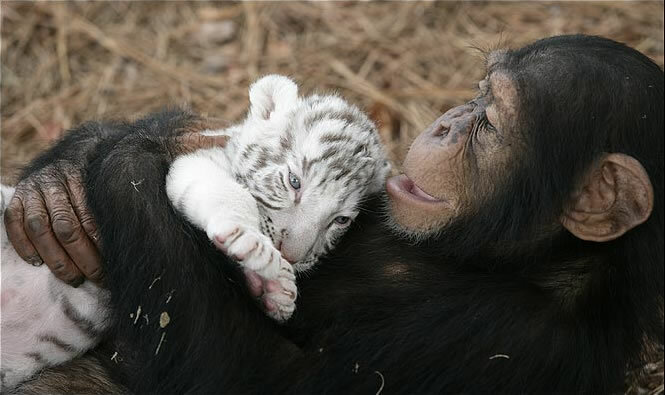 Anjana has been helping zoo keeper China York look after 23-day-old cubs Mitra and Shiva at TIGERS (The Institute of Greatly Endangered and Rare Species) in South Carolina, US. 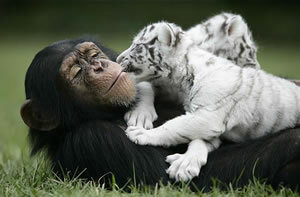 The chimp took on the crucial surrogate role after the youngsters were separated from their mother. 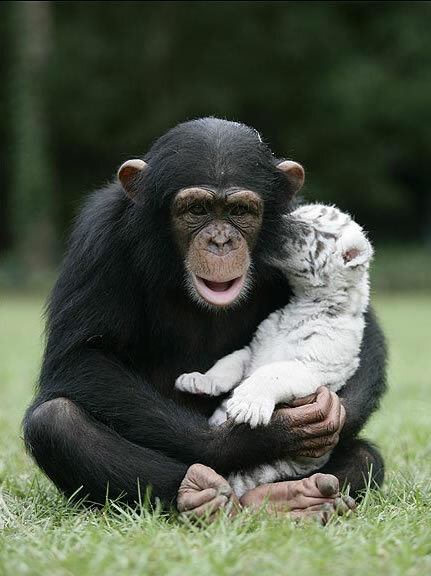 She turned aggressive after being spooked when hurricane Hannah ripped through the institute. 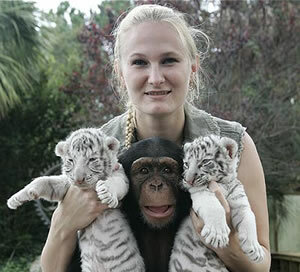 Anjana has been a constant companion to infant animal carer China - and the chimp loves aping her work. TIGERS founder Dr Bhagavan Antle said: Anjana has joined China in caring for baby animals. 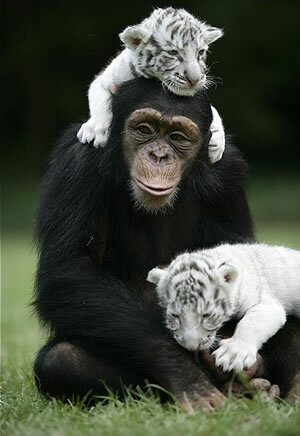 Monkey see, monkey do and Anjana has helped China raise them. 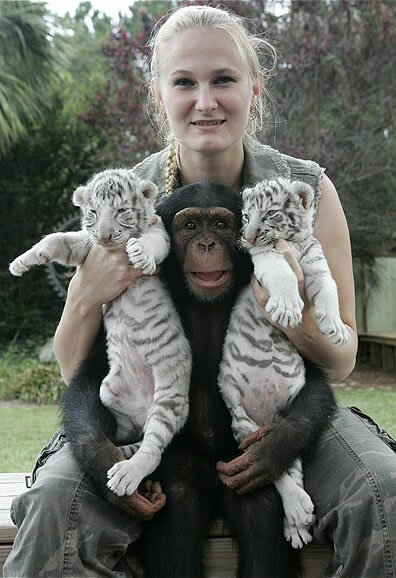 She has acted as a surrogate mother to leopards, lions and orangutans and has done the same with these baby white tigers. 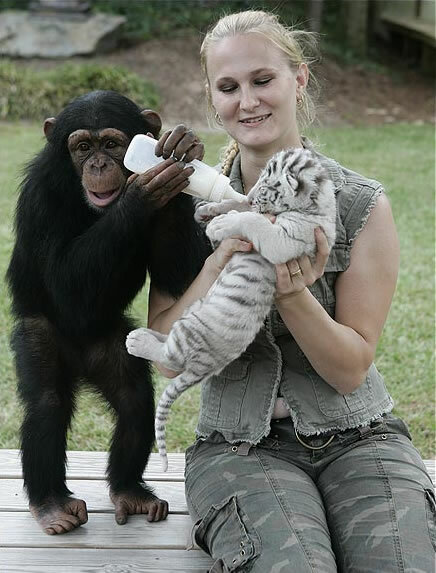 She gives them a bottle and lies with them - she is a great assistant. 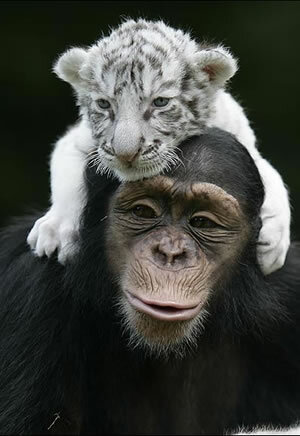 TIGERS has bred and reared many rare and talented animals. 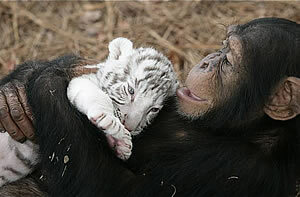 This year they unveiled their latest liger cub - bred from a lion father and a tiger mother. The institute has 45 big cats, including white-and-red-striped golden tabby tigers - one of the rarest big cat breeds. 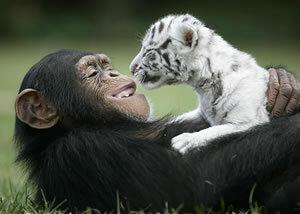 There are also bears, other primates and an African elephant. 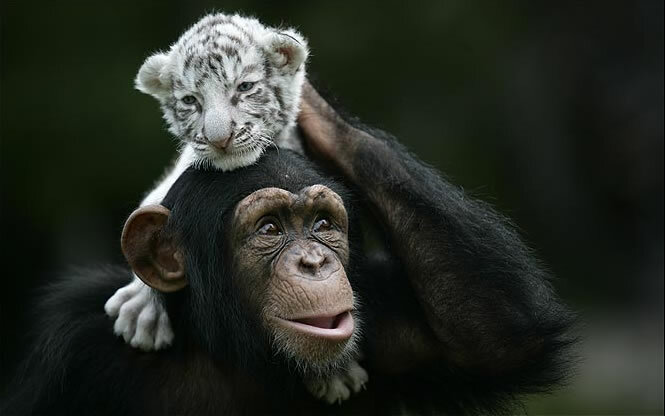 The highly-trained carers at the institute have trained animals to appear in more than 500 movies, including Hollywood blockbusters Dr Dolittle and Forrest Gump. Dr Antle added: The animals are given thousands of hours of training and constant care. 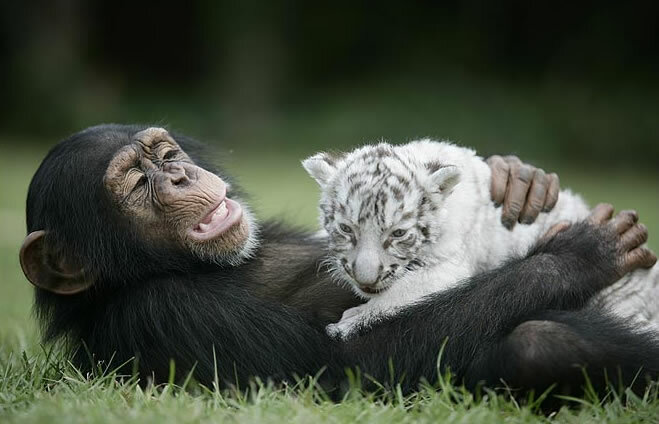 People think it is dangerous to get so close to wild animals but the handlers have been with them since they were cubs and have developed a special friendship based on love and respect. 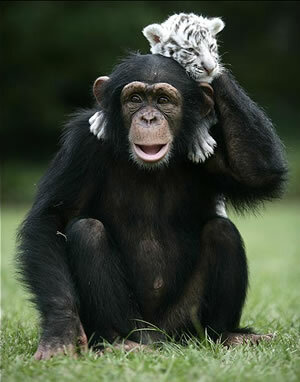 That might be the case but Anjana should be careful around her feline friends. 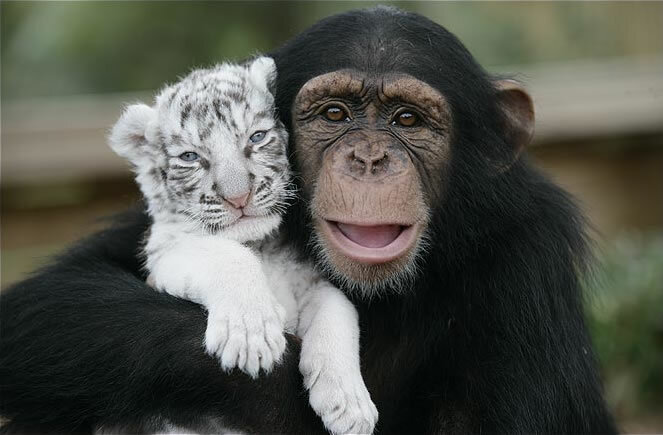 White tigers can grow to nearly 660lbs and when they do, Anjana will no longer be just a cub sandwich - she could end up as a portion of chimps.